Adena certified nurse practitioner Andrea Howard donates blood in the Hoxworth bloodmobile at the Gold Star Chili parking lot in Hillsboro. 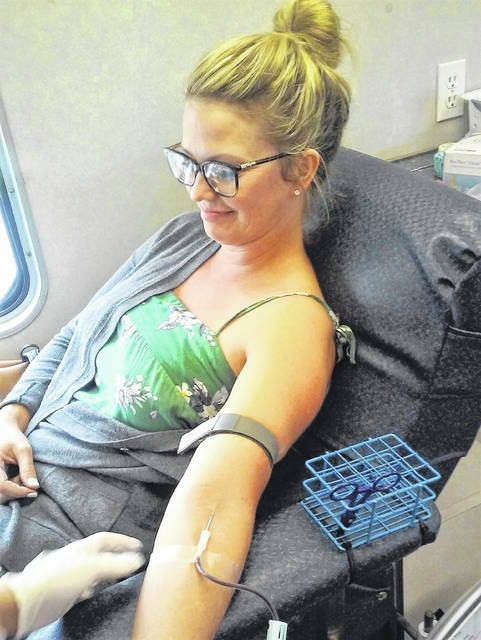 Every two seconds, someone in the U.S. needs blood, and Andrea Howard of Hillsboro and Brandon Ledford of Mowrystown did their part in Hoxworth Blood Center’s bloodmobile Thursday afternoon when it visited Hillsboro. According to figures provided by Hoxworth, that one pint of blood will save three lives. One in seven people entering a hospital will need a blood transfusion, with the average transfusion being three pints of red blood cells, according to Hoxworth. The need is so great that Hoxworth estimates it needs 300 blood donors and 40 platelet donors every day. Howard has been a certified nurse practitioner for six years, and entered the medical profession because she wanted to help people, but at the same time, she doesn’t like needles. Of all the miracles of modern day medicine, blood is the one thing that can’t be artificially made. Despite the serious need for blood, Bailey noted that less than 10 percent of the population ever donates. Bailey shared stories of people that visited the bloodmobile because of a 6-week-old grandbaby just diagnosed with leukemia, a father that was undergoing surgery, or a child that was critically injured in an automobile accident, and all can be helped with blood donations. “We’ll separate the platelets, plasma and red cells later, because each component has a different use,” Bailey said. Red blood cells can be stored for up to 42 days and are used for surgery and trauma, according to Hoxworth, while plasma can be frozen and stored for a year for use with burn patients. The platelets, with a shelf life of five days, will go to help people fighting cancer. A person can donate whole blood every eight weeks, but it will be twice that long if you donate only the red blood cells. Donations of platelets and plasma can be done every two weeks. “Before showing up to donate, be sure to eat and fully hydrate yourself,” Bailey advised. She recommended using common sense after donating, such as leaving the bandage on for about an hour, no strenuous activity for 24 hours, drinking lots of fluids, eating a good meal, not using tobacco products for at least 30 minutes, and avoiding alcoholic beverages for several hours. According to Hoxworth guidelines, any person 16 years of age and older can donate blood. However, people under 18 must have parental consent and meet both height and weight requirements. Otherwise, any healthy adult who weighs at least 110 pounds can donate, but there are some restrictions. “Tattoos are a big thing these days, and they have to be clean, healed, dry and pain-free within the last year from Ohio or Kentucky, can’t be from Indiana,” Bailey said. Piercings have to be from a one-time sterile use kit, and another big restriction is travel due to people returning from foreign countries with malaria. People will be asked if they are HIV positive, have traveled to countries in Equatorial Africa, or are recreational drug users. Howard’s donation took a little over 5 minutes, and after a 10-minute wait, she was up and ready to go back to her office at the Adena Health Center next to Kroger on Roberts Drive. According to the Hoxworth website, the bloodmobile won’t return to Hillsboro until May 14 of next year. They will be back in the area, however, on Wednesday, Oct. 24 at 1:30 p.m. at the Lynchburg Area Joint Fire & Ambulance District firehouse on SR 135.
https://www.timesgazette.com/wp-content/uploads/sites/33/2018/08/web1_Bloodmobile-pic.jpgAdena certified nurse practitioner Andrea Howard donates blood in the Hoxworth bloodmobile at the Gold Star Chili parking lot in Hillsboro.